Anthem is a small community with a peaceful, Sonoran Desert setting on the north edge of Phoenix, elevation 1,800 feet. Many saguaro grow on the surrounding, undeveloped land, on the slopes of Daisy Mountain to the north and the Union Hills to the south. Most of the district is residential, including the upscale dwellings around Anthem Country Club; the town also has two schools, a community sports park and several shopping centers, the main one (Anthem Marketplace) close to I-17 exit 229, Anthem Way. Also beside this exit are the business premises of Anthem Commerce Park, and Old West Cactus Farm, which offers an extensive collection of desert plants. Another attraction of the town is Daisy Mountain Railroad, featuring a replica steam engine on a half mile track, 24 inch gauge. Anthem has the northernmost chain lodging in the Phoenix area, and so the first for travelers arriving from Sedona (86 miles), Flagstaff (117 miles) and the Grand Canyon (195 miles). Downtown Phoenix is 34 miles south along the interstate. 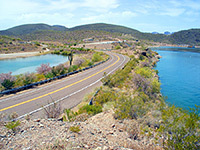 Three nearby attractions are Lake Pleasant (19 miles west along Hwy 74), Bartlett Lake (40 miles east) and Agua Fria National Monument (20 miles north along I-17). Thirty four miles north of downtown Phoenix, the developing community of Anthem has one hotel: the 76 room Hampton Inn, built adjacent to exit 229 of I-17, just across the street from the Outlets at Anthem Mall and several other large stores including Wal-Mart. The inn has an excellent reputation, for the good free breakfast (with hot items), the reasonable rates, the friendly staff and the large, well equipped accommodations - all have a refrigerator & microwave, work desk and high quality bedding. Many of the rooms have views across the mostly undeveloped surroundings towards distant mountains. A pool, fitness center, business center, laundry and meeting rooms are the other main amenities.